Camden Market is a market area near the Hampstead Road Lock (usually known as "Camden Lock") of Regent's Canal, in the Camden Town area of London. Additionally, there are also many small shops in the area. A variety of different goods are available in market stalls. These include crafts, clothing, shoes, fast food, and items associated with alternative culture. 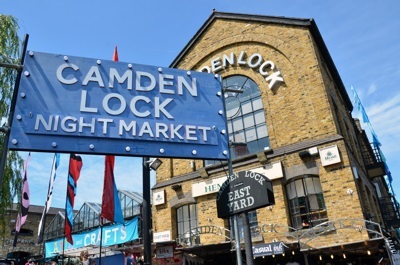 This area of Camden has particularly strong associations with the pop music scene (the groups Madness and The Clash are both especially associated with the Camden area), and this is reflected both by many market stalls, as well as by the presence of a number of live music venues in the area.